Perine finished 2018 with eight carries for 32 yards and three catches for five yards in five games. Analysis: Disappointing as a rookie, the 2017 fourth-round pick spent most of his sophomore campaign serving as a healthy scratch. Perine likely will need to compete for a roster spot in 2019, though he could find an opening for a meaningful role if Adrian Peterson leaves Washington and Derrius Guice (knee) continues to struggle through the rehab process from a torn ACL. Perine (coach's decision) won't play in Saturday's game versus the Titans. Analysis: Saturday's designation means Perine will miss his sixth straight game and fourth as a healthy inactive. Adrian Peterson, Chris Thompson and Byron Marshall will continue to field the touches out of the backfield. Perine (coach's decision) won't play in Sunday's game versus the Jaguars. Analysis: Perine will sit out for his fifth straight game and his third as a healthy inactive. With Perine watching from the sidelines, Adrian Peterson, Chris Thompson and Byron Marshall will work in the backfield. Perine (coach's decision) is inactive for Sunday's game versus the Giants, Kareem Copeland of The Washington Post reports. Analysis: Perine's inclusion on the Redskins' inactive list is less surprising than that of Kapri Bibbs, who also is a healthy scratch. With the duo unavailable Sunday, Adrian Peterson, Chris Thompson and Byron Marshall will compose the options out of the backfield. Perine (coach's decision) is inactive for Monday's game against the Eagles. Analysis: Perine has only run the ball five times this season for a total of 25 yards, and with Chris Thompson (ribs) back in action Monday, the Redskins are not in need of a fourth running back. They will instead roll with Thompson, Adrian Peterson and Kapri Bibbs in a key divisional matchup. As long as all three aforementioned backs stay healthy, it will be difficult for Perine to see playing time in Washington's backfield this season. Perine (calf) isn't listed on the Redskins' initial Week 13 injury report. Perine (calf) is listed as inactive Thursday in Dallas. 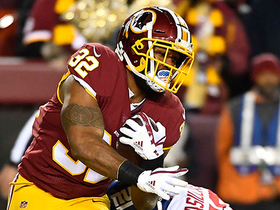 Analysis: With Perine and Chris Thompson (ribs) out of commission, Kapri Bibbs and Byron Marshall will be afforded the few running back touches that don't go to Adrian Peterson in Week 12. Perine (calf) is listed as questionable for Thursday's game in Dallas. Analysis: Perine opened the week as a non-participant in practice before upgrading to limited showings Tuesday and Wednesday. With Adrian Peterson taking most of the carries while Kapri Bibbs and Byron Marshall handle passing-down work, Perine may stay on the inactive list even if he's healthy enough to play. Perine (calf) was listed as a limited participant in Tuesday's practice, David Helman of the Cowboys' official site reports. Analysis: Perine missed Sunday's game against the Texans and was listed as a non-participant on Monday's estimated injury report. His return to practice on a limited basis is encouraging, but because the Redskins play on Thursday, he might not be fully ready in time for Week 12. Perine (calf) was listed as a non-participant on Monday's estimated injury report. Analysis: Although Perine got rid of the knee injury that appeared on the practice report last Thursday and Friday, he wouldn't have participated Monday if the Redskins held a session. He has two more practices to prove his health, with the aim to provide support to starter Adrian Peterson (shoulder) on Thursday in Dallas. If Perine and Chris Thompson (rib) are sidelined again, Kapri Bibbs and Byron Marshall would be afforded those opportunities. Perine (calf) was David Helman of the Cowboys' official site on Monday's estimated injury report. Coach Jay Gruden announced Perine (calf/knee) has been ruled out for Sunday's game against the Texans. Perine (knee/calf) was a limited participant in Thursday's practice. Analysis: Perine is a surprise addition to Thursday's injury report, after the second-year running back was able to practice without issue to begin the week. The details of Perine's knee and calf injuries remain undisclosed, and his Week 11 availability appears uncertain. 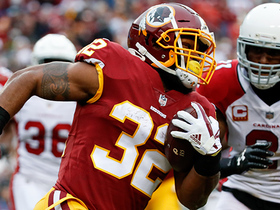 Perine has yet to see more than two carries in a single game this season, so his presence one way or another is unlikely to affect Washington's offense during Sunday's contest against the Texans. Perine is active for Sunday's contest at Tampa Bay. Analysis: Perine has been called upon this season during Chris Thompson's (ribs) three absences, and he'll do the same Week 10. In those outings, Perine accrued 30 yards from scrimmage on eight touches. With Adrian Peterson and Kapri Bibbs in front of him, Perine can't be expected to receive more than a handful of looks, barring an injury to one of the pair. Perine took two carries for 20 yards and caught two of three targets for eight yards in Sunday's 38-14 loss to Atlanta. Analysis: Perine was active for just the third time all season, handling a 22 percent snap share behind Adrian Peterson (46 percent) and Kapri Bibbs (30 percent). There isn't much cause for optimism moving forward, as all of Perine's targets and carries came on the meaningless final drive in a blowout. He'll have a tough time staying involved Week 10 at Tampa Bay. Perine is active for Sunday's contest against the Falcons, Kareem Copeland of The Washington Post reports. Perine (coach's decision) is inactive for Sunday's contest at the Giants. Analysis: Perine was kept on the gameday roster during Chris Thompson's (ribs/knee) two-game absence but only played 10 offensive snaps and 18 on special teams. Perine's production wasn't anything special, either (four touches for two yards from scrimmage). Don't expect another appearance unless injury befalls another member of the backfield. Perine carried the ball twice for two yards during Sunday's 20-17 win over the Dallas. Analysis: Two yards on four touches: That's been Perine's contribution to the Washington offense in two active games this season. Perine is only seeing the field because Chris Thompson (ribs/knee) is on the shelf. Given Perine's poor production in Thompson's absence, expect Perine to return to the inactive list as soon as Thompson is back in action. If that absence extends to Sunday, Perine is likely to gather Adrian Peterson and Kapri Bibbs' scraps against a middle-of-the-pack Giants run defense. Perine is active for Sunday's contest versus the Panthers, Kareem Copeland of The Washington Post reports. Analysis: For the first time this season, Perine cracked the 46-man gameday roster. The opportunity arose with Chris Thompson (ribs/knee) inactive, but Adrian Peterson is still on hand to handle the bulk of the carries while Kapri Bibbs is the best bet to act as the Thompson fill-in. If he sees the field Sunday, Perine's track record includes 3.4 YPC and 22 catches (on 24 targets) in 16 games during the 2017 campaign. Perine (coach's decision) is listed as inactive Monday at New Orleans. Analysis: Perine has yet to be on the Redskins' 46-man active roster for gamedays this season, likely due to the effective backfield duo of Adrian Peterson and Chris Thompson. The preceding likely will be Perine's reality unless something befalls Peterson or Thompson. Perine (coach's decision) is inactive for Sunday's game versus the Packers. Analysis: With the placement of Rob Kelley (toe) on injured reserve this week, Perine was expected to earn active status for the first time this season Week 3. Instead, the Redskins promoted Kapri Bibbs from the practice squad Saturday and opted to make him the No. 3 running back behind Adrian Peterson and Chris Thompson. At this point, Perine appears to be a persona non grata in Washington. Perine will move up to third on the depth chart after Rob Kelley (toe) was placed on injured reserve Tuesday, John Keim of ESPN.com reports. Perine (coach's decision) is inactive for Sunday's contest against the Colts. Analysis: Perine remains the odd man out in the Redskins backfield with all of Adrian Peterson, Chris Thompson and Rob Kelley in good health. As a result, Perine will kick off his second pro campaign with back-to-back absences. Perine (coach's decision) is listed as inactive Sunday in Arizona. Analysis: After rookie Derrius Guice was lost for the season due to a torn ACL, Perine had a chance to stake a claim to the backfield, but that was before Adrian Peterson was signed off the free-agent scrap heap. Peterson impressed during the preseason, and with Chris Thompson and Rob Kelley also on hand, Perine seemingly will be the odd man out on game day as long as the top three are healthy. Perine has a spot on Washington's initial 53-man roster, JP Finlay of NBC Sports Washington reports. Analysis: Faced with a decision between Perine or Kapri Bibbs for the final RB spot, Washington chose pure running ability over passing-down skill. Perine may enter Week 1 at the very bottom of the depth chart, potentially stuck behind Adrian Peterson, Chris Thompson (leg) and Rob Kelley. The second-year pro likely would be part of a committee if Peterson were to get benched or injured. Perine (ankle) took seven carries for 30 yards and failed to catch his lone target in Thursday's preseason loss to Baltimore, also losing a fumble along the way. Perine (ankle) should be ready for Thursday's preseason game against Baltimore, JP Finlay of NBC Sports Washington reports. Perine (ankle) was spotted at practice Sunday, JP Finlay of NBC Sports Washington reports. Analysis: In the wake of Derrius Guice's ACL tear, Washington is still sorting out its running back options. Perine's return to the field helps keep him in the equation on that front, along with fellow returnees Rob Kelley and Chris Thompson. Meanwhile, recent addition Adrian Peterson made a strong case for a key role out of the gate with an 11-carry, 56-yard effort in Friday's preseason loss to the Broncos. Coach Jay Gruden said Tuesday that Perine is approaching a return to practice, JP Finlay of NBC Sports Washington reports. Perine (ankle) likely will be out for at least a week, Mike Garafolo of NFL Network reports. 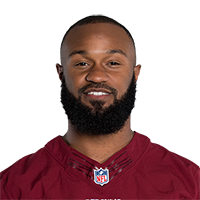 Coach Jay Gruden said that Perine is dealing with a sprained ankle but is believed to be okay, JP Finlay of NBC Sports Washington reports. Analysis: Perine had a scare in Thursday's preseason game against the Jets when he hurt his ankle at the tail end of a 30-yard run. Fortunately, the Redskins are saying that Perine's sprain won't cost him significant time, and he'll have a full week to get treatment before the team makes a determination on his status for the third preseason game. WIth Derrius Guice (knee) already lost for the season, the Redskins figure to be cautious with Perine. Perine (ankle) won't return to Thursday's game against the Jets. Analysis: Perine left early in Thursday's game to be evaluated for an ankle sprain prior to being ruled out. He only had one carry in the game, on which he churned out an impressive 30 yards. His status for next week's game against Denver is uncertain. Perine left Thursday's game to be evaluated for an ankle sprain. Analysis: Perine moved up the depth chart when Derrius Guice (knee) was ruled out for the season. An ankle sprain would almost surely cost him some practice time, but the issue shouldn't affect him over the long term. Perine's workload for the upcoming season is expected to increase following Derrius Guice's ACL tear, Peter Hailey of NBC Sports Washington reports. Perine appeared as the No. 3 running back on the Redskins' first unofficial depth chart, Adam Zielonka of The Washington Times reports. 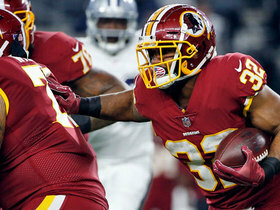 Perine finds himself in a crowded backfield alongside Chris Thompson (leg), Rob Kelley (ankle) and rookie second-round pick Derrius Guice, Kimberley A. Martin of The Washington Post reports. Redskins coach Jay Gruden said there's a good chance the team will use an early draft pick on a running back to join Perine, Chris Thompson (leg) and Rob Kelley (ankle) in the backfield, Grant Paulsen of 106.7 The Fan DC reports. Perine, who totaled three yards on two rushing attempts in Week 17's loss to the Giants, finished the season with 603 rushing yards and one touchdown on 175 attempts to go along with 22 receptions for 182 yards and one touchdown. The Redskins ruled Perine (ankle) out of Sunday's road contest against the Giants. Analysis: Perine likely will undergo a battery of tests in the coming days to hone in on a diagnosis. For the rest of the Redskins' season finale, though, the offense will trust in Kapri Bibbs to lead the backfield. Perine is questionable to return to Sunday's road game against the Giants due to an ankle injury. Analysis: Perine left the contest on the Redskins' second offensive play, a four-yard run. If Perine is unable to get the all-clear for more snaps, Kapri Bibbs will likely handle the bulk of the touches out of the backfield. That said, the recently-promoted Dare Ogunbowale is also around to spell Bibbs. Perine carried 17 times for 53 yards and caught three passes for an additional 21 yards during Sunday's 27-11 victory over the Broncos. He also lost a fumble. Analysis: Perine averaged just 3.1 yards per carry on the ground, but a healthy allotment of touches allowed him to pile up 74 scrimmage yards. He left the game briefly in the fourth quarter with an apparent Achilles injury but was able to return to finish off the contest. Perine could be limited throughout the week as a precaution, but his ability to return to the fray bodes well for his availability against a hapless Giants team on New Year's Eve. Perine (Achilles) returned to Sunday's game versus the Broncos. Analysis: After sitting out a portion of the fourth quarter to have his Achilles examined, Perine was made available for the rest of the contest. If the injury persists into Week 17 prep, the hype surrounding reserve running back Kapri Bibbs could finally yield fruit in Washington. Perine is questionable to return to Sunday's game against the Broncos due to an Achilles injury. Analysis: Perine has been befallen by one of the few dreaded injuries, at least before the final diagnosis is known. Clearly, the Redskins are leaving the door open for reentry to the contest, but if he doesn't make another appearance, he'll finish Week 16 with 15 carries for 53 yards and three receptions (on as many targets) for 21 yards. In his stead, the Redskins will turn to Kapri Bibbs out of the backfield. Perine (groin) is active for Sunday's game against Denver, Adam Schefter of ESPN reports. Analysis: Perine missed practice Friday due to the groin issue, so he may not be at full strength. Kapri Bibbs could still get significant carries as a result. Perine (groin), who is listed as questionable for Sunday's game against the Broncos, is considered a game-time call, John Keim of ESPN.com reports. 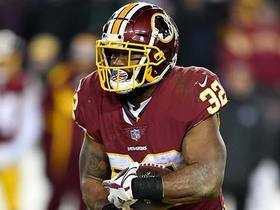 Perine (groin) said he'll be fine for Sunday's game against the Broncos, while Redskins head coach Jay Gruden wasn't so sure, Matthew Paras of The Washington Times reports. Perine (groin) is listed as questionable for Sunday's game against the Broncos, John Keim of ESPN.com reports. Analysis: Perine and LeShun Daniels (broken hand) both suffered injuries Thursday, leaving Kapri Bibbs as the lone running back available for Friday's practice. With Daniels out for the season and Perine seemingly on the wrong side of the 'questionable' tag, the Redskins figure to promote Dare Ogunbowale from the practice squad before Sunday. Should Perine end up missing the game, Bibbs might be asked to handle a three-down role, albeit against a stingy Denver defense. Perine (groin) and teammate LeShun Daniels (illness) both missed Friday's practice, John Keim of ESPN.com reports. Analysis: Perine injured his groin Thursday and wasn't able to finish practice. His continued absence Friday suggests he's in serious danger of missing Sunday's game against the Broncos, potentially leaving Kapri Bibbs as the Week 16 starter. With Daniels also absent, Bibbs was the only running back on the field at Friday's practice. Head coach Jay Gruden said Perine injured his groin in the early portion of Thursday's practice and missed the rest of the session, John Keim of ESPN.com reports. 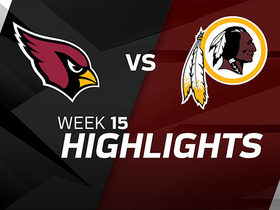 Perine rushed 14 times for 37 yards and caught both his targets for 29 more in Sunday's 20-15 win over Arizona. Analysis: Perine averaged just 2.6 yards per carry for the second consecutive game, lowering his season average to 3.5. The rookie fourth-rounder out of Oklahoma is the top rushing option in Washington's injury-depleted offense, but he's scored only one rushing touchdown. After an explosive receiving performance in this one, practice squad callup Kapri Bibbs could be the man to own in this backfield given Perine's plodding style and underwhelming results. Perine (illness) wasn't listed on the Redskins' injury report Wednesday. Redskins coach Jay Gruden said Monday that Perine is merely dealing with an illness and should be okay. Perine is questionable to return to Sunday's road game against the Chargers due to a stomach concern. Analysis: There's no hint of the nature of the issue, but if Perine is unable to re-enter the contest, head coach Jay Gruden will likely touch on the running back's health in an upcoming media session. At the time of his departure, Perine had 17 carries for 45 yards and corralled all four passes sent his way for seven yards. Because his backup Byron Marshall was ruled out earlier due to a hamstring injury, the Redskins' sole healthy back on the 53-man roster is LeShun Daniels. Perine rushed 12 times for 38 yards and brought in all three of his targets for 31 yards in Thursday's 38-14 loss to the Cowboys. He also recovered a fumble. Perine racked up 100 yards on 24 carries to go along with three receptions for 30 yards in Thursday's 20-10 win over the Giants. Analysis: With fellow running back Chris Thompson (lower leg) placed on injured reserve, Perine saw the bulk of the work in the backfield on Thanksgiving. He handled lead-back duties well, as he contributed an efficient 4.2 yards per rush. The rookie, who was coming off his first career 100-yard rushing game, now has two in a row and will attempt to make it three in the Redskins' Week 13 matchup versus the Cowboys. Perine (finger) is active for Thursday's game against the Giants. Analysis: Perine is slated for lead-back duty moving forward due to season-ending injuries to Chris Thompson (lower leg) and Rob Kelley (ankle). After the first 100-yard performance of his career Sunday at New Orleans, Perine will be seeking to do the same against a New York defense that has given up 107.3 rushing yards per game to running backs in 2017. Perine (finger) is listed as questionable for Thursday's contest versus the Giants, Kimberley A. Martin of The Washington Post reports. Perine (finger) was a limited participant in Tuesday's practice. Analysis: The finger issue isn't considered anything overly concerning, so the Redskins are presumably limiting Perine's practice reps after the busiest game to date of his young career in Sunday's loss to the Saints. Perine, who amassed 126 total yards and a touchdown on 24 touches in the contest, looks positioned to serve as the Redskins' lead back the rest of the way with Chris Thompson (lower leg) joining Rob Kelley (ankle) on injured reserve Tuesday. Perine (finger) is listed as a limited participant on Monday's injury report for Thursday's game against the Giants. Perine rushed 23 times for 117 yards and a touchdown while adding a nine-yard catch on two targets in Sunday's 34-31 overtime loss to the Saints. 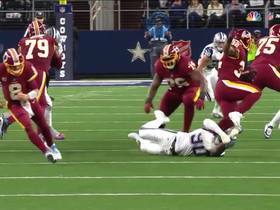 Analysis: Fellow running back Chris Thompson broke his fibula in this one, joining Rob Kelley (ankle/knee) on the list of sidelined Washington running backs. Those two injuries should leave Perine with all the touches he can handle moving forward, especially since he took advantage of an expanded role in this one with career-highs in carries and rushing yards to go with his first career rushing touchdown. The rookie fourth-rounder out of Oklahoma may yet live up to the preseason hype that surrounded him. Perine will take over as the starting running back while Rob Kelley misses time with ankle and knee injuries, John Keim of ESPN.com reports. Perine carried the ball nine times for 35 yards and added a 25-yard catch in Sunday's 38-30 loss to Minnesota. Perine recorded two carries for nine yards in Sunday's win over the Seahawks. Analysis: Although it wasn't much, Perine worked his way into the offensive gameplan Sunday after failing to record a rep with the unit the previous two weeks. However, Washington seems content continuing with the two-headed attack of Chris Thompson and Rob Kelley in the backfield, which will leave the rookie with little fantasy value. For now, Perine's biggest contributions will likely come on special teams. 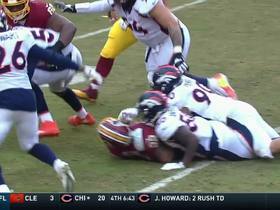 Denver Broncos linebacker Von Miller rips the ball free from Washington Redskins running back Samaje Perine, Broncos recover. Washington Redskins quarterback Kirk Cousins finds running back Samaje Perine as he sneaks out of the backfield and runs for 23 yards. 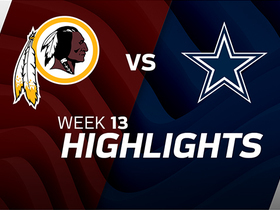 Dallas Cowboys defensive end Demarcus Lawrence explodes past Washington Redskins tackle Morgan Moses and tackles Samaje Perine for a loss. Washington Redskins running back Samaje Perine slips through blockers for 15 yards on the first run of the game. NFL Network's Jane Slater gives an update on how Samaje Perine could have a big role tonight against a banged up Dallas defense. Washington Redskins running back Samaje Perine finds an opening and jets up the field for a 16-yard gain. 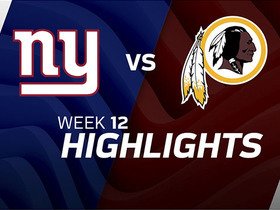 Washington Redskins running back Samaje Perine conquered a perfect screen catch against the New York Giants in Week 12.